Well, almost 1/2 way through the month and I'm still going strong, working out everyday! I'm losing weight and feeling good. 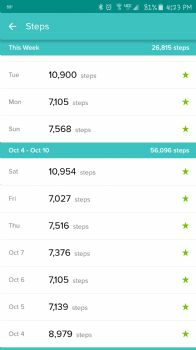 My steps are seriously lacking today, though I do have training tonight so I'll get a some more steps in. I think I'll go a few minutes early so I can get some time on the treadmill before hand. Anyhow, just a quick update today to show that I'm sticking with it! I hope everyone is having a great week! Good job getting in a groove! It feels good once you get there doesn't it??? You are doing a fabulous job! Keep it going!